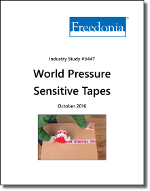 Global demand for pressure sensitive tape is projected to increase 4.3 percent per year to 53.4 billion square meters in 2020. While carton sealing tape will continue to account for the majority of demand, a number of specialty tape types -- including medical and double-sided tapes -- are expected to register faster growth. The Asia/Pacific region, which is already the largest regional market, will continue to register above average advances. This study analyzes the global pressure sensitive adhesive (PSA, or self-adhesive) tape market. Historical data (2005, 2010, and 2015) and forecasts for 2020 and 2025 are provided for self-adhesive tape shipments and sales by type (carton sealing, masking, electrical and electronic, double-sided, medical, other) and primary backing/liner material (polypropylene, paper, polyvinyl chloride, other) on country-by-country and regional bases. Data are presented primarily in square meters. Companies mentioned include 3M, Nitto Denko, tesa, and Lintec.